Batavia, NY (October 8, 2018) – While attempting to avoid a collision that took place between a van and an SUV on Route 33 Monday afternoon, October 8, a big rig driver overturned his vehicle causing a large oil spill. The exact time that the crash occurred was not specified, but it was stated that crash happened at or near the intersection of Route 33 and Wortendyke Road. According to police, the truck driver was attempting to avoid a second accident that had recently occurred in the same area. Diesel fuel was spilled from the truck during the accident, however, responders were able to quickly clean it up upon their arrival. 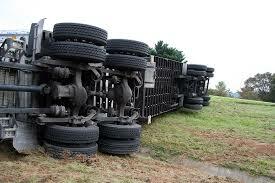 The condition of the truck driver has not been specified. Furthermore, the driver of the SUV involved in the first crash was reported to have suffered injuries. The cause of the crash between the SUV and the van is currently under investigation by authorities. Above all else, we would like to extend our deepest and most heartfelt sympathies to the confirmed victim of this crash as we maintain hope for their full recovery. It is tremendously important to realize that as a victim of someone else’s negligent behavior, you may have rights following a car or truck accident in New York. Our compassionate New York accident attorneys at Hach & Rose have devoted their lives to serving the innocent victims of negligent drivers and other entities. As members of the community, we are passionate about making our roads a safer place for all of us who share them. We understand the overwhelming physical, emotional, and financial burdens that increase in the wake of a New York car accident. If you or a loved one have been injured in an accident due to someone else’s negligence, please don’t hesitate to call 212-779-0057 today.